Knute continued to create music in a variety of contexts as he pursued a career in software development and raised his family. Although he also played horns, woodwinds, strings, and percussion, piano was always his favorite. He began playing comedy improv in 2001, working with the talented actors at ComedySportz, Portland. He created a show there entitled "Concerto for Piano and Mime," in which audience suggestions are used to create mime scenes accompanied by all-original improvised keyboard. 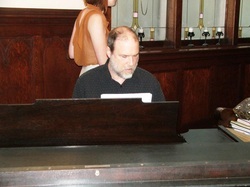 Knute plays a lovely Steinway at Grace Bible Church in downtown Portland on Sunday mornings, with a variety of music teams and worship styles.